We love you Jeri! Oh and I guess we love Zach, too :) You are simply marvelous to offer these incentives. Not that we need them to support you and the man of the hour, I'm sure we'd all do it any way. Just remember "These colors don't bleed!" A vote for the Scott means a win that is hot! #TeamKilt let's get ready to rock! I just voted! 11 votes each. I hope it stays tied for a while so Zach has a chance to win! 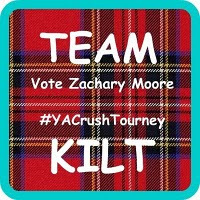 Also, i decided that WHEN Zach wins the whole tourney, you have to sing 'Forever' at TeamKiltCon! I'm sure once we all have a scotch or two in us, you'll sound quite lovely! BAHA!! Now i'm off to go pimp our boy!! This is pretty amazing! SOOO glad I live in Minneapolis (minneapolis bloggers are pretty cool ;)) Can't wait until Zach wins! Voted for Zach ! continuously voting and tweeting ! A TeamKiltCon?? How stinking fun!!! We definitely need to win this thing!! I can't express enough how truly cool I think you are. Your generosity of spirit and ability to turn strangers instantly into friends are so inspiring to me and do more than you'd think to restore my faith in humanity. Proud member of #TeamKilt here!